And is it that good? The term gravekeeper here means something else. When one usually hear about the gravekeeper, one immediately concludes that it is someone who guards a grave, hence the name. However, in this book, a gravekeeper is something much more deeper and painful. And it was a girl called Meria, who is the gravekeeper, not Muoru. Arai Enji, the author, mentioned in the foreword that he [I presume he’s a guy] was fascinated with the term of gravekeeper ever since started writing light novels and continues to use gravekeeper as a basis until he eventually writes Sugar Dark, and proceeds to twist it around into something new. Sugar Dark then proceeds to win a grand prize award back in 2008 or 2009 thanks to it’s unique nature, which allows it to be published later. I was thankful to come across this book when I was browsing the website NanoDesu translation, as that time, I was interested with the “Light Novels”. You know light novels, right? A novel originated from Japan which is unique for it’s use of manga/anime illustrations accompanying it. Sugar Dark was written by Enji Arai and illustrated by Mebae, who is not a popular illustrator himself. So where is the uniqueness of Sugar Dark? If asked where is the uniqueness of Sugar Dark, then it has to come from it’s unique style of writing. The author makes a heavy usage of metaphorical similiarity in the book, allowing for an easier understand as well as interesting choice of wording found on the book. The book also makes a numerous reference to the modern-era japanese despite not really being set on a modern-day japanese, which was interesting. Since I don’t understand Japanese, especially it’s written form, the translation from NanoDesu helped me to understand it well enough and while Baka-Tsuki had trouble keeping it in-check with the source material, it still gives footnotes of something which is hard to translate and as a result, creating a unique feel to Sugar Dark. Big shout-out to NanoDesu Translation, especially those who work on this light novel, great job in making Sugar Dark a beautifully-translated light novel. The story focuses on Muoru and how he was forced to keep digging the graveyard by the antagonist after being falsely accused of murder. Murou, at first, is portrayed as a submissive man who does nothing but whatever he was told by his jailor, but his meeting with Meria, the female heroine of the story, changes his principle and allowed him to mature into someone stronger, who manages to courageously confront the antagonist, as well as having the supporting character help him. There are four named characters in the story, which is the aforementioned Muoru, Meria Mass Grave [Yes, it was stylized like that according to the translator], Crow or Karasu, and Daribedor. The author describes all of them with distinction and heavily, allowing the reader to better imagine the character and easily as well. The accompanying illustration also helps out the character, though it arrives far bit too late. The accompanying character illustration of Daribedor is notable for being almost on the last bit of second chapter, making me unable to really comprehend how Daribedor is actually envisioned by the writer. The rest of the characters and their illustration are okay, with them appearing near when they were introduced, it’s just Daribedor who had this problem. Speaking of illustration, it is fair to say that Mebae, the illustrator, keeps his illustration in check and his illustrations were decent at that. When one reads Sugar Dark, it was a bit gore-ish as there are numerous instance of monster ripping apart someone, and Arai making an accurate description of how that person’s inside is being teared out. However, Mebae does not make his illustration that much gore-ish and allows it to intrigue me and much of the wider audience who does not really favor gore. Returning to characters, all of them are fleshed out accordingly. As the story reached it's eventual climax, we knew exactly how each of them behaves and their personality, as well as their appearance. By the time the story ends, I know how no-nonsense Muoru was, how cute and affable Meria was despite her initial cold behavior, how cunning and assisting Karasu was, and how polite yet deceiving Daribedor was. It was wonderful. There are several unnamed characters appearing, as well as those who are named yet does not really appear in the story, and I choose to ignore them. The pacing of the story was also great. There are only 3 chapters, or holes as being written in the story, but each of them are accompanied by sub-chapters that makes it easy to sometimes stop the read, or to mark the sub-chapters. And each page does not have a wall of text with them, instead, there are a huge line-space in between each paragraph to make it easier to understand and easy to read. The plot itself was remarkable. Muoru, who was falsely accused of murder, was forced to dig holes to bury monsters that Meria defeated. The way of Meria defeating the monster itself was not something common, and it was painful reading it. The story focuses on how Muoru initially tries to escape from his imprisonment, then it changes into one where Muoru resolves to release Meria from her fate, which is worse than death. Crow himself was intrigued by Muoru and proceeds to help him out. The difference between Crow and Meria is that since Meria is a gravekeeper, Meria cannot adhere to the sunlight, whereas Crow does not really like the night and as a result, both character never interacted with each other until the story reached climax, with Muoru acting as a stand-in for the two characters. Of course, the way the story was build-up to the climax was great and there were no plot-holes on it. Everything was told from the first to start, with accurate description being made to any terms on the story, such as the gravekeeper term itself, which in this story, stands for someone who has to endure an everlasting pain of killing a monstrous being spawning in the grave. The reason why the monsters appear? Well, they gather for something bigger, which Muoru later faced in the story’s climax. The genre was initially… Well, how do I describe it… At first, I thought it was going to be a dark-themed action as there is a reference on a monster. However, it turns out to be a drama story, which satisfies me a lot, between Muoru and Meria with a lot of supernatural and fantasy spices, before it transpires finally into a romance between them. Thank you a lot for not blessing me with an action-oriented story though, as I thought this was going to be it. If I am being told to spoil one or two event, then I want to mention two thing. First is how Muoru asked Crow to fetch him a big construction-helmet, which he initially used for his digging labors, before the curious Meria asked him what was that helm for. Muoru answered by putting the helm to Meria and as Meria struggled to keep the helmet fit, as the helmet was too big for her head, Muoru proceeds to kiss the helmet holding her head and I was really surprised but pleased reading the chapter. Well, it was hinted that Muoru has already fell in love to Meria ever since he met her, but this strengthen all that claim and he even mentioned it in his mind that he “loves this girl”. And another is how he and Meria had a last meeting before Muoru’s biggest task to confront the last monstrous being. Meria, who is implying that Muoru is tryong to leave her behind, hugs her from behind. Muoru, overwhelmed with feeling, faces her and embraces her. It was really heartwarming and cute, until he snaps Meria’s neck. My god, that time when I was reading, I was surprised. But it was necessary for the story to proceed. Read the rest if you are interested though, as I will only limit myself to two spoiler right now. The story was too good. And it was around 300 pages or so, making it a good read for those interested in a longer story. It is a one-shot light novel as well. While the author mentioned that he is planning to write the sequel for it, it has never come out and I presume this is the only novel in the series. 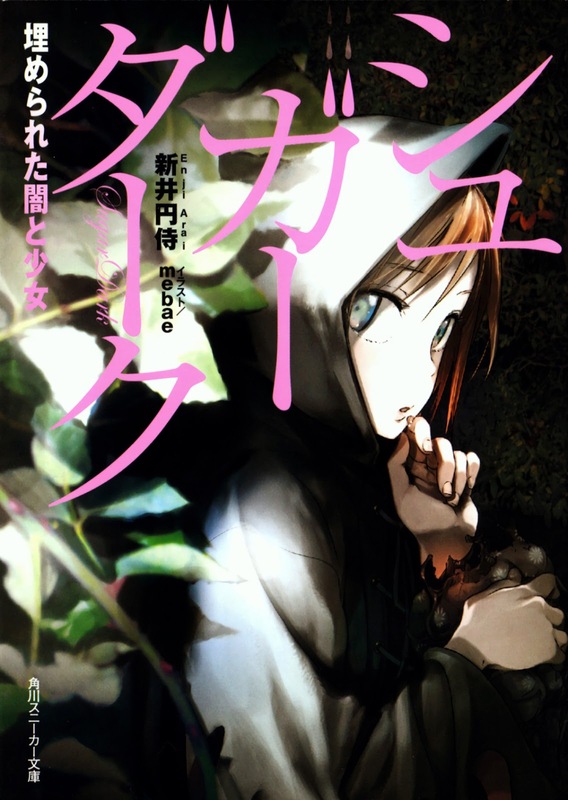 Sugar Dark would also be adapted into manga series, which I later plan to read. If this series would be adapted into an anime series, a 12-episode one would be better to accompany it’s unique nature of the story, as well as to adapt it faithfully to the end. One-shot novels are never great when it is adapted into a 24-episode anime. Even sometimes 12-episode anime were too much for a 200-long light novels, with Chuunibyo the prime example for it. It is, however, something to be talk about in another review. All in all, Sugar Dark is a great piece of light novel with unique nature. It’s uniqueness is it’s core strength for why it is so interesting to read. The plot can be fairly easy to understood by almost all-reader and the accompanying artwork is decent. With this being the sole release of the series, i can say that upon finishing the series, one will not really need a continuation, though a continuation will not be rejected by those who want it. Those who enjoyed supernatural story should really pick this one up, as it is the central theme of the story. There is no action inside this story, however, and the battle I mentioned earlier… Well, you understand how the gravekeepers ‘battle’ them monsters upon reading Sugar Dark. For me, it was an audacious pick, since I am not really that down with supernatural stories, and I myself assume that the story was going to be action at first, which left me dumbfounded upon knowing that this was not the case and immediately felt I was blessed reading this. I was left with a smile that stretchered from ear to ear upon finishing this to be honest. The good : Beautiful story with unique plot. Characters were unique. Interesting Theme. The bad : Illustrations were, while being decent, not that remarkable. Background are not really focused here. Highlight scene : Those two scenes I mentioned earler. Final Score : 4 out of 5. Again, not more and not less. Looking forward for the author’s next work. To be honest, I can easily see why it won the grand-prize award upon finishing it… It took me 2 months to finish reading Sugar Dark, as I read it only during my spare time in college and sparingly at home. Note : This is the first time I reviewed a light novels, as I am a bit new to the light novel world to be honest. But, be prepared for a lot of light-novel related entry in the future.